On a baking show I was watching recently, the contestants had to make a certain kind of bread. For the bread to turn out, they had to “prove” their dough, a professional baking term for letting the dough rise before baking. And, being the writer I am, it reminded me of writing. As writers, we also need to “prove” our manuscripts. Once we finish assembling our ingredients of plot, character, theme, and setting into the dough of our first draft, we need to give our manuscript time to sit. If you try to edit right away, either you will be so in love with your words how they are that you won’t edit enough or you will be so wiped by the first draft that you’ll hate your words and be tempted to throw them all away. Instead, be willing to give it time. It is amazing the change of perspective that comes about by not touching a manuscript for a few weeks or a few months. Sometimes, I have a manuscript that I absolutely adore. When I take it out again, I start to see all the places that it isn’t actually as great as I thought it was. Sometimes, I have a manuscript that I toss into a drawer in frustration because it fought me every step of the way while drafting. When I take it out again, I see the places where it isn’t actually as bad as I thought. There might even be something worth saving in it. 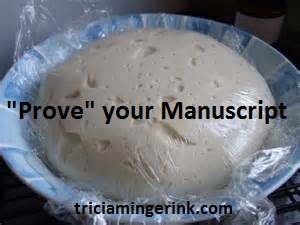 Like proving bread, proving your manuscript takes patience. It is very tempting to take it out too early and start fiddling with it even though you know it needs to sit longer. What about you? How much time do you give yourself between writing a first draft and editing it? I agree that taking a break between the first draft and the second draft is so important. On the GTW blog I read that writers should take at least six weeks off from their manuscript before editing, but for my first novel I took three months off, and it really helped. I guess it will depend from novel to novel for me. I think another good thing to prove is the idea. When I get an idea, I usually feel really inspired, but sometimes that original motivation and excitement can wear off. If I’ve had an idea for a month and I’m still excited about it, then I write it. I usually take about 3 months between drafting and editing as well. I agree that ideas need to be proved as well. If they rise and grow after you set them aside, then they are usually an idea worth pursuing. If they fall flat when you pick them up again, then you know that one might be better not to write at the moment. I took 4 weeks off of my WIP, partly because I literally plot out almost every scene before I write it, (so it wasn’t anything close to a bare bones first draft) and because I already knew most of the things I wanted to change as soon as I finished writing the first draft. Also, I felt like I would go insane if I stayed away from it any longer. 🙂 While I was taking my break, I decided I wasn’t going to “write” anything. (As in a short story, or start a new manuscript.) So all I did was plot out a lot of book 2, and write out my editing plan. 4 weeks worked really well for me, but every writer is different. Four weeks sounds like a good amount of time for you, especially since you took a break from writing entirely. I waited three months between writing and editing, but I went ahead and wrote the next book in that time. If I wasn’t writing the next book, I probably would’ve only waited a month or so.